The explosion of cryptocurrency ASIC miners have made ASIC-resistance one of the most widely-debated topics of this year. Project teams who argue against ASICs have taken various approaches towards resisting them; one common approach is to implement memory-hard hashing algorithm, pushing the cost of manufacturing specialized mining machines higher and reducing their efficiency over off-the-shelf equipment. In modern computer architecture, CPU and memory communicate through a data bus. In the recent decades the speed of CPU and size of memory have improved much faster than the throughput between them, leading to a phenomenon known as Von Neumann bottleneck. Hashing algorithms such as Ethereum’s Ethash, Zcash’s Equihash, and Grin’s Cuckoo Cycle all to some extent take advantage of this characteristic in design. Integrating on-chip memory on ASIC is expensive. Around 2014 when ASIC miners were first commercialized, the tactic of using memory-hard algorithms to resist ASICs made sense due to the higher cost of RAM. 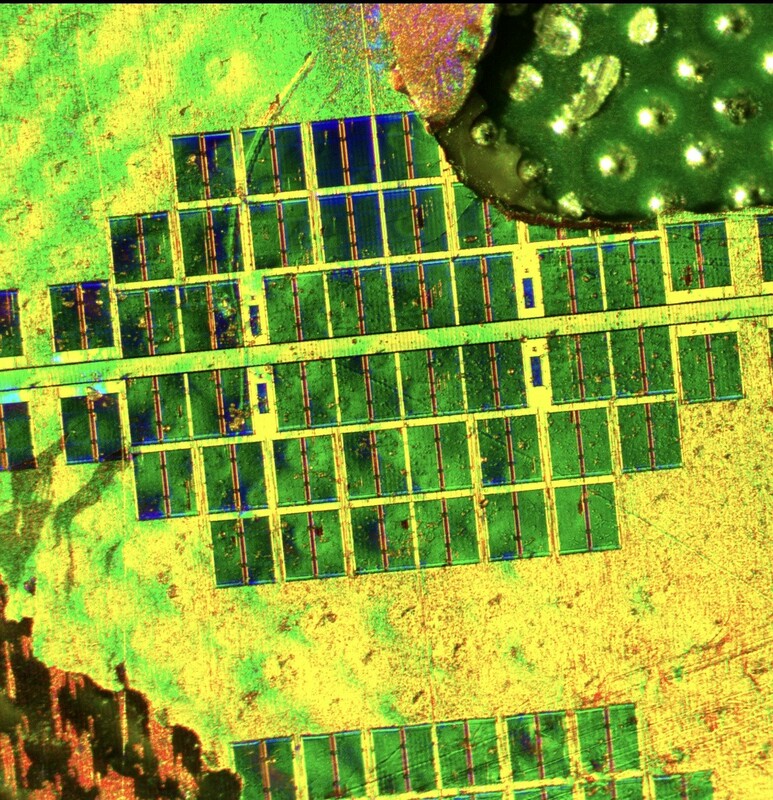 In the past few years, the sharp decline of RAM cost makes it possible for ASIC designers to manufacture machines for these networks at increasingly low cost. Memory-hard algorithms cannot keep ASICs at bay indefinitely. Imagine two countries, each with a billion cities, and imagine picking a billion border crossing roads that connect a random city in one country to a random city in the other country (the PoW actually uses a cheaply computed hash function to map the nonce, road number, and country to a city). We are asked if there is cycle of 42 roads visiting 42 different cities. If someone hands you a nonce and 42 road numbers, it is indeed easy to verify, requiring negligible time and memory. When the concept was first published in 2015, it was considered “ASIC-resistant” because designing an ASIC miner requires well over 1 GB of SRAM, which is rather expensive when used as embedded memory. 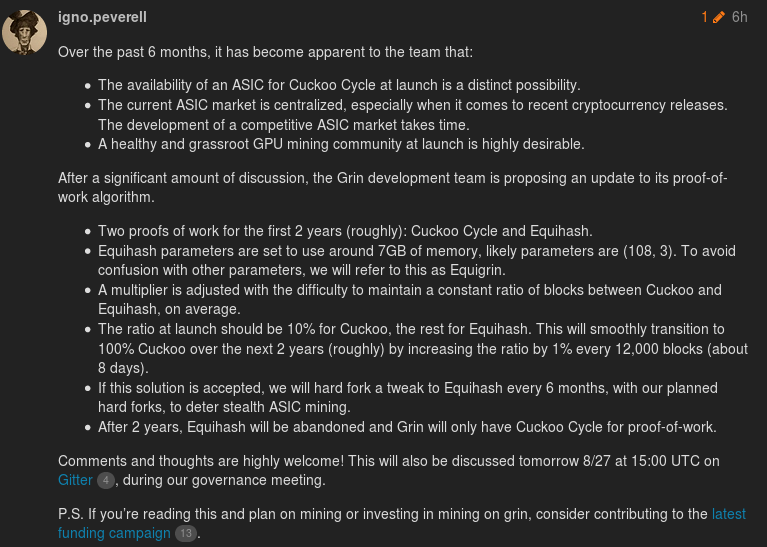 Recently, as the Grin project captures more attention, the community found out there are ASICs under development even before the project is launched yet, because the old requirement for memory is no longer expensive. In an effort to include GPU miners on the network, the dev team proposed modifying the hashing algorithm to make it much more memory-hard. Equihash is currently used by Zcash, Horizen (ZenCash), Bitcoin Gold and a few others. The algorithm is based on generalized birthday problem. The combination of two parameters N and K, will determine how long it requires to find a solution as well as how large the solution is. For instance, ZEC, ZEN, and ZCL are based on Equihash (N=200,K=9), which mean the minimal requirement is around 140MB (watch a review of Z9 mini here). After suffering the 51% attack in May, Bitcoin Gold switched to Equihash (N=144,K=5), which would require 2.5GB. The combination (N=108,K=3) proposed for Equigrin requires roughly 7GB, making it the most memory-hard algorithm on the market right now. “Based on this observation and two important properties of Bitcoin’s PoW (its global and cumulative effects) we’ve formalized the utility of PoW with a very simple mathematical formula defining the total number of bitcoin.days secured by the system. Originally published on Iterative Capital News. Sign up for our newsletter here. Iterative Capital is a large-scale cryptocurrency miner, investment manager, and private trading desk.